Friends of the Island Fox is happy to announce the gift of five radio collars for foxes in the fire zone on Santa Catalina Island. A HUGE Thank You to everyone who stepped forward to help when the island fox was in need. Individuals can make a difference and working together we can save these endangered local creatures. Your concern about the island foxes on Santa Catalina Island in the wake of the fire and your generous donations have funded the purchase of five radio collars. Which foxes will receive the radio collars? The injured fox is currently doing very well, and is expected to make a full recovery. Her weight has increased substantially and her paws are healing. The little female fox has been moved to a pen at the captive breeding facility to continue her rehabilitation. When she is released, she will be fitted with one of the FIF radio collars so that her success in the wild can be monitored. In order to ascertain if any other foxes in the fire area were injured the Conservancy set up monitoring traps. 15 individual foxes were captured (9 females, 6 males). No injuries were observed, and all captured foxes were at or above average weight. Three of the caught females showed signs of actively lactating. These females are good evidence of pups that survived the fire. 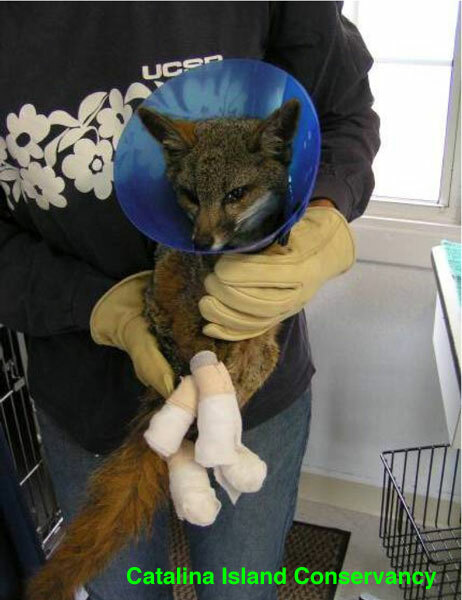 Four foxes trapped in the fire area were also fitted with radio collars donated by Friends of the Island Fox. 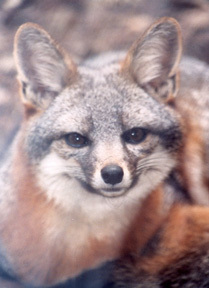 Watch four island foxes being released into the wild on San Miguel Island. Make sure you look for their radio collars. Why are radio collars important? Radio collars alert biologists not only to a fox’s location but whether or not it is alive. Flying over the burn area, biologists were able to pick up signals from the radio collared foxes and determine they all were alive. On Santa Cruz Island this spring, radio collars provided the first alert that a golden eagle was once again preying on island foxes. Across the Channel Islands, foxes are raising this year’s pups. For their own protection, these precious new additions to the island fox populations will need radio collars. But each radio collar costs $250. With your donations we can see that more island foxes have radio collars. Spring is pupping season for the endangered Channel island foxes and each birth is a celebration. While we are waiting to hear how many pups were born out on the islands, the Santa Barbara Zoo happily announced the birth of a new island fox. The male pup was born April 12, 2007, to a pair of older parents from San Clemente Island. The mother was unable to nurse the tiny pup and therefore it is being handreared by the Santa Barbara Zoo staff. Fitting in the palm of your hand, the pup weighed only two ounces at birth–less than 2 AA batteries. Staff members attended to feedings six times a day, 24 hours a day, and the pup quickly doubled its weight. Currently this brings the total number of island foxes in Zoos to 12. Where can you visit a zoo with island foxes. Captive breeding has played an important role is reestablishing island fox populations. What is captive breeding? Animal management protocol developed at the Santa Barbara Zoo and other zoo facilities has helped provide valuable information on how to keep island foxes safe and healthy in captive environments. Working together zoos and conservation land managers are saving this endangered species. Friends of the Island Fox supports their efforts and works with them to educate the public about the island fox and its unique habitat, the Channel Islands.